32 • WRAPS • 2 0 1 8 W here to begin...all vehicles are different and each cus- tomer's needs and design specs are going to vary. So how do I know when and where to use an overlay on a full wrap or print-out graphic to my advantage? When you have a designer who can wrap and who understands the do's and don'ts of a smooth installation, your production time and install times will get faster. The art of your design skills truly comes out when you achieve a wrap-around look on the vehicle that would be super difcult free styling with large wrap kits by stretching and heating only. We all know of the notorious fade to a color before a body break, but some cars bumper/hood fender body lines fall in random plac- es, creating a lot of dead space or areas that may seem unbalanced. Some common difcult areas: • Hood to fender art • Bumper to fender wrap around • Side graphics/stripes that wrap around rear We all have the same tools, printers and wrap vinyl, but the only thing that sets you apart from everyone else is your art and the nishing of your wrap. First, the artwork needs to be clean, effective, readable and with a successful marketing image for your customer's product and service. Second, anyone can get a wrap on, but is it on straight, with no wrinkles or bubbles, and most impor- tantly are the nished lines and edges clean and secure? The main reason I use certain overlay techniques is solely to speed up installations, production and ease of kit assembly for a variety of installers with different skill levels. Keep in mind that certain pieces need to go on rst for proper outcome. Sometimes both sides need to be exact on placement; other kits may need some clever knife-work to achieve on the y. A lot of super sneaky kits are cut on hard lines I have created in my art- work, knowing what I had planned ahead of time. Last and most importantly, make sure you charge properly for the wrap puzzle pieces you have created. 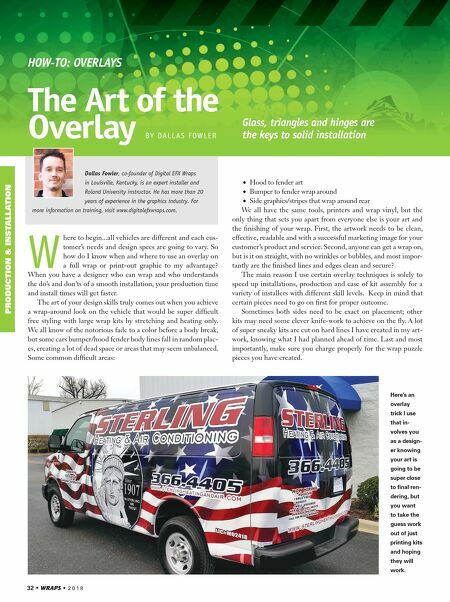 HOW-TO: OVERLAYS The Art of the Overlay BY DA L L A S F O W L E R Glass, triangles and hinges are the keys to solid installation Dallas Fowler, co-founder of Digital EFX Wraps in Louisville, Kentucky, is an expert installer and Roland University instructor. He has more than 20 years of experience in the graphics industry. 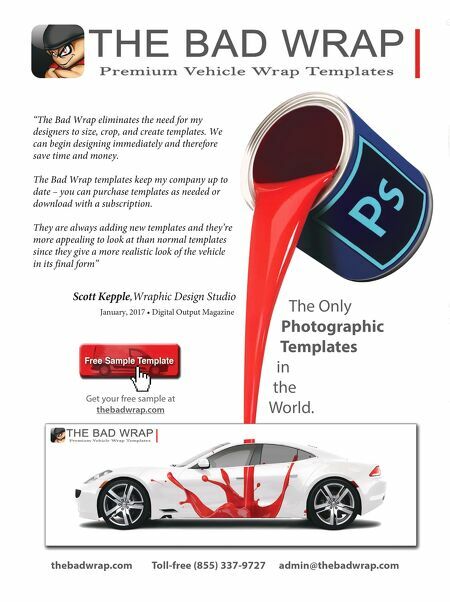 For more information on training, visit www.digitalefxwraps.com. PRODUCTION & INSTALLATION Here's an overlay trick I use that in- volves you as a design- er knowing your art is going to be super close to final ren- dering, but you want to take the guess work out of just printing kits and hoping they will work.